Today, January 17, is the Feast of St. Antony of Egypt. We remember with thanksgiving his life and seek his prayers and guidance for our own lives. His biography, The Life of Antony, was written by St. Athanasius. 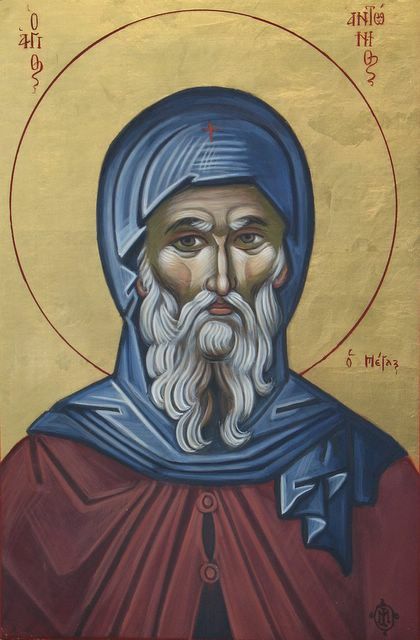 St. Antony’s desert journey began one Sunday morning in a small Egyptian village in the year 270 or 271 when he heard these words: “If you want to be perfect, go sell your possessions and give to the poor, and you will have treasure in heaven. Then come, follow me” (Mt. 19:21). Antony took these words literally; giving his land to neighbors, selling his remaining property, and entrusting his sister to the care of some Christian women. Antony became a disciple of a local hermit. As time went on Antony moved further into the desert geographically and spiritually. as one always establishing a beginning, he endeavored each day to present himself as the sort of person ready to appear before God – that is, pure of heart and prepared to obey his will, and no other. And he used to tell himself that that from the career of the great Elijah, as from a mirror, the ascetic must always acquire knowledge of his own life (Life of Antony, p. 37). “Guard [yourselves] from lewd thoughts and pleasures of the flesh” so as not to be deceived by the feeding of the belly. St. Antony has given us a rule of life, a guide for the formation of our lives. “Patterning our lives in this way, we shall be able to enslave the body, as well as please the Lord and trample on the deceptions of the enemy” (Life of Antony, p.73). Thank you Father for this beautiful and inspiring web-site! May the blessings of Christ our God be with you always in your priestly ministry. Thank you for your kind and encouraging words. I hope you will read more and feel free to offer your own ideas and insights.